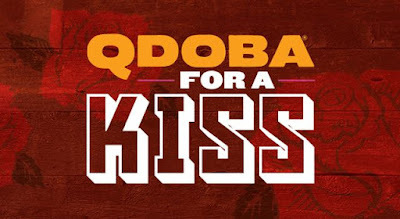 Qdoba is once again running their "Qdoba For A Kiss" where you can get a free entree with the purchase of an entree when you share a kiss at the register on Valentine's Day. The deal is good at participating Qdoba locations on February 14, 2016 only. The required kiss can be to your significant other, your friend, or even yourself (or even a picture... of anything). Qdoba entree choices include Knockout Tacos, Burritos (or Burrito Bowls), Mexican Gumbo, 3-Cheese Nachos, Grilled Quesadillas, and Taco Salads. You can find your nearest Qdoba using their online store locator.